Let’s get real crazy here and start with a pretty standard question. Ambush was formed as late as in 2013 I think. How did it happen? – We were sitting in an apartment and as we have always been friends with each other, we decided to do something together since we all listened to the same stuff. What were the bands you had in common and listened to? – Of course the big ones from the mid-eighties, like Judas Priest, Accept and Iron Maiden. Have you known each other pretty much for your whole life? – Maybe not for our whole lives, but at least for a couple of years, like five, six or maybe even seven years. Do you have a background from other bands? – Yeah, most of us played in other bands before, but not very serious bands, more like hobby-bands.We weren’t in those bands together. You started out by doing your Facebook-page in Swedish. Were the ambush…eh…ambitions quite low to begin with? – No, I think I was mainly because most of our fans in the beginning were Swedish. A lot of them were our friends and such, and our primary aim was to reach out to locals around our town and here in Sweden. Suddenly we got requests from all around the world, from people wanting to buy our demo tape. Then we kind of had to write in English. Were you surprised at how fast the music of a new demo band spreads around the world? – Yeah, I think so. Its easy to say bad stuff about Facebook and social medias, especially when it comes to their influence on album sales, but I think they all have really helped new and upcoming bands in our situation. Now we can say for real that we have fans. From the beginning we got a lot of help from another band from Växjo called The Scams. They were really helpful to us. You’re fans of the eighties heavy metal, but there is no denying it was a lot harder to spread your music back then? – Yeah, in that way it was much more difficult to do it in the eighties, but at the same time, the labels seemed to have more money. As soon as you got a contract back then, you pretty much knew you would make it, because the companies were so powerful. A record deal today doesn’t really mean anything, at least not in that way. You don’t get rich,but the labels help you to record your album and to spread it. The downside is that you don’t get paid for it. Were you surprised how fast and seemingly easy you got a record deal? – Yeah, I think we have to say that. We only released a demo tape with four songs on Spotify and then did one live show before the first record label contacted us, but I think we turned their offer down, or we simply didn’t answer because High Roller had already contacted us. I think we ended up turning down two or three other record companies. So did you choose High Roller mainly because you, as you mentioned, got them recommended by the guys in The Scams? – Yeah, we heard from a couple of bands around here. A local band called Screamer also had a hand in it. High Roller gave us the best deal, simple as that. If I understand the information that followed the promo-CD correctly, you also started Ambush a bit out of frustration of the new stuff coming out not up to the standard of the old bands. What’s wrong? – We’re not so satisfied with the new wave of metal that is coming. You know the band Dead By April from Sweden? A lot of that kind of metal shows up nowadays, and a lot of people call that stuff heavy metal, but it certainly isn’t. That’s why we got a little frustrated and wanted to do it our way. The correct way, or at least what we think is the correct way. In my opinion there are some great traditional metal bands coming through as well. – Yeah, Enforcer, Air Raid, Ram, Bullet and stuff like that. They’re really good, it’s not they we’re complaining about. 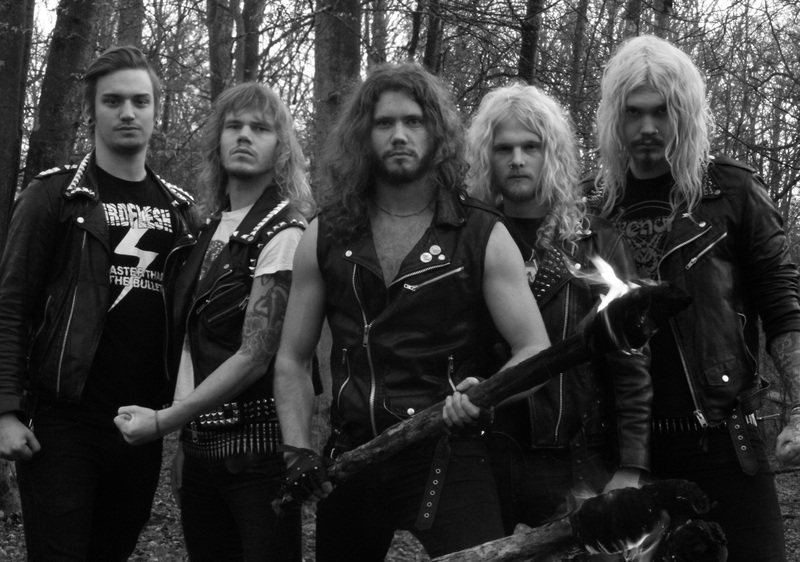 – I know there are a lot of bands doing similar stuff,and there is a wave of new Swedish heavy metal, but this is the music we would like to do. Of course we’re inspired by the other Swedish metal bands, but we’re definitely doing it our own way. It’s not about following a trend, we do what we love, the eighties heavy metal. That’s why we work together as a band in the first place, we share the same interest and listen to the same music. What do you mean by saying you want to do it your own way? Is there an original aspect in the sound of Ambush? – It’s always hard to describe your own musci, I guess every band in history has always said the same thing. It’s kind of hard to make our music sounding fresh or unique because we sound a lot like Accept and Judas Priest, but we try to do it our own way, the way we want the music to sound. It’s probably easier to just listen to it and then you’ll probably understand. Do you think it’s easier to get a record deal playing this music coming from Sweden? – The Germans like Swedish people and I believe they like Swedish heavy metal too. As you know, we’re from Sweden, so we don’t what it’s like being a heavy metal band from another country. You released a demo in the summer of last year. Three of the songs from the demo is also on the album, I guess the ones on the album are newly recorded versions? According to the guys there is a significant difference between the demo- and album versions. – Especially regarding the production. The production on the album is bigger and heavier. It sounds the way we wanted it to sound. When we recorded the demo tape, we didn’t have the money to do it properly. Also, the single we released, has a different mix and master compared to the one on the album. But apart from the differences in production, the songs themselves haven’t changed that much on their way from the demo to the album? – It’s just another production, the lyrics and the melodies are the same. There was also one song on the demo that isn’t on the album. Why did you leave it out? – “Fading To Black” is a good song, but the tune came up pretty early in the process, when the band was quite new. It took some time to find the way we should sound,and we don’t think that the song is good enough to be on the album. At the early stage at the career of the band, I guess you are often looking for constructive feedback. Did you get some feedback on the demo that you could use in the preparation for the album recording? – Yeah, we got some reviews and people telling us what was good and what was bad. If the criticism comes from the right people, we listen and try to take it all in. At the same time, we don’t want to rely too much on other opinions. So who are the right people then? – I think people who knows about this kind of music, are experienced or plays in other bands. People we respect in general. Ambush recently had a track on the Bonus-CD of the encyclopedia of Janne Stark, but the guys are not sure how much extra exposure they got out of this. – We don’t know much about the sales of the book, but of course we hope we got some new fans. It was funny to be a part of it, but I don’t think we reached a lot of new listeners, but we didn’t expect that either. We know Janne, and of course we said “yes” when he asked us if we wanted to be on the CD. Still it must be kind of nice to be part of something like that? – Yeah, we were very pleased to be on it. It was a really nice gesture from Janne. 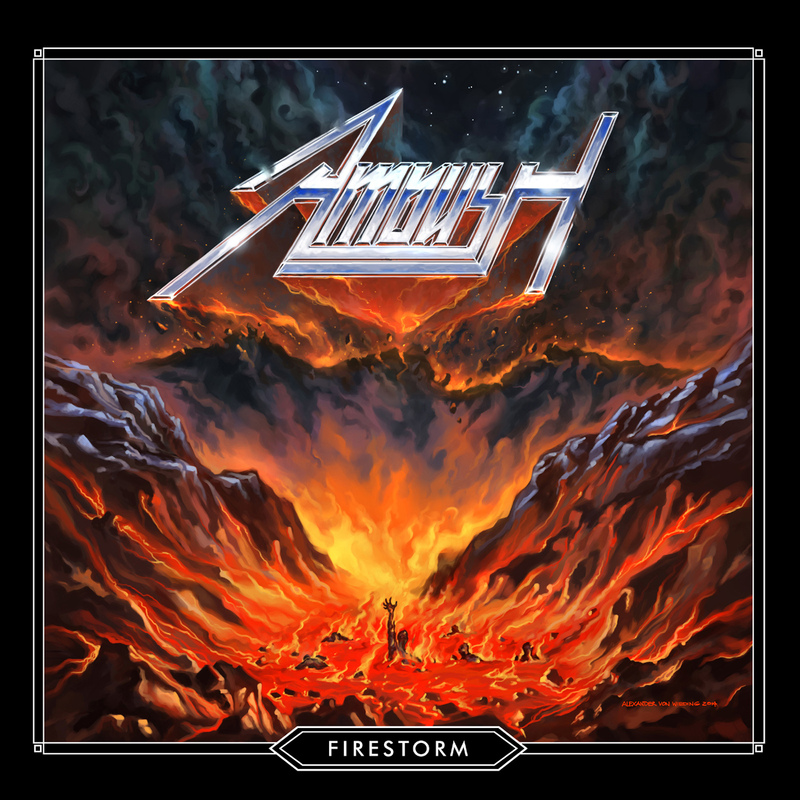 Did everything about the recording of “Firestorm” go as you planned? – No! Haha! It never does. We had a few problems, some minor problems, but we are very happy with the album, the cover and the songs. After having recorded the single, we decided to change the producer for the album, as the guy really couldn’t create the sound we wanted for the album. So the production on the album is done by another guy. What was wrong with the workf of the first producer? – We can all agree that his work sounded pretty good, but not good enough to be on a real album. It didn’t really fulfil our expectations. We wanted the production to be a little bigger, not too modern, but generally better. A real sound, an album that sounds like it was made during the eighties. – Since this is our first album and we know how we wanted it to sound, we didn’t really have a choice. We just had to fix it. The producer from High Roller Records, offered to do the whole mix and mastering and assured us he would do a better job than on the single. We took a chance, but he’s been doing this for 20 years or something, and did a great job this time too. Was the release of the single, “Natural Born Killers”, the idea of the record company, or something you came up with yourselves? – We contacted High Roller and asked them if they wanted to release a single. They decided how many copies should be printed and also that it would be available as a 7 inch. We already had the contract with them, and thought it would be cool with the single before the album. – In fact they sum up the whole Ambush-sound. We do both the fast songs as well as the songs that are a bit slower, and wanted to make a more diverse album, that never bores the listener. Those songs simply are the best ones to release on a single. We will also be releasing a video soon, for the track “Natural Born Killers”. It should be out on the May 1 or at least around that time. Is this similar to the one you already made for “Don’t Shoot, Let Em Burn”? – No, this is a completely different thing, a real music video done with a professional producer. This is not an amateur video, we contacted a guy who does this for a living. It’s a much bigger production and a much more serious video. The first one looked like it was a lot of fun to make though, was making the new one just as cool? – It was just as fun to make it, but the work behind it was a lot harder. The first video was all about partying, shot with a mobile camera, and put together on the computer. This new one is a professional thing done with a man who has done a lot of similar productions before and knows what he’s doing. It wasn’t difficult to make the video, because all we had to do was just to stand there and play. It was a lot of hard work behind it though, when we made the performance parts of the song, we played “Natural Born Killers” about 60 times. Did you get bored with the song then? – Ah, maybe a little bit, but it was also a lot o fun. – For us it’s a complete record. We are so proud of everything, the cover art, the songs, the whole package or experience. The album has a lot of variety, still all songs are traditional heavy metal songs. It’s a good experience to listen to the whole album, and we have also worked a lot on getting the track order right. This also helps preventing the album from getting boring. There are also some nice band photos, we are pleased with the lyrics and sound as well. We see the album as a piece, a real album, not only a handful of songs put together. Everything should work togheter as a product. Did you have any influence on the cover art? – We knew what we wanted it to look like, and had a strong idea what Ambush would be about. We put our thoughts together and made something cool out of it. So where is there room to improve until the next album? – There isn’t any! Haha. No, there is always room to improve, but you must remember that this is our first album and we hope it’s good enough. We want our next album to be better of course, but at the moment it sounds very difficult, as we just finished “Firestorm”. However, I am sure the songs will come to us. We had already started writing some new tracks which sound good. You’ve said that “We play our heavy metal hard, raw, melodic and with a touch of evil”. Where is this touch of evil to be found, in the music or in the lyrics? – I think it’s a combination. When we’re writing the lyrics, we put a lot of thought into them. It’s important that the lyrics are good, not only some words thrown together. Some of them are kind of evil. I don’t know why, but this is how we write music. Who are writing the lyrics? – I think we do it together. All the songs are written by different members of the band, and the lyrics are written by the singer, the bass player and one of the guitarists. We try to help out as much as we can. Some write riffs while others write lyrics. Is there one or two lyrics on the album that you are particularly satisfied with? – It’s kind of difficult, as we put a lot of thought into all of them. But maybe “Master Of Pain”? At least the lyrics, together with the music, create some sort of image in your head. There is a good story behind those lyrics. – I don’t want to be one telling you about it. It should be up to the listener to decide what the song is about. We certainly wrote it with one thought in our heads, but believe people should create his own images. A lot of people have listened to the song, and have felt it differently. You’ll have to be open to the fact that people might interpret your lyrics differently from yourselves then? – Yeah, of course. That’s fine. Ambush is not what we could call an experienced live band yet, but they’re working on it. – I think we’re playing our fifth gig this weekend, in Gothenburg in Sweeden. It’s a two day indoor festival at Sticky Fingers, a pretty famous rock club. We’re playing with Bullet, Bonafide and ’77. It’s a pretty strong line up. We’re pleased to be a part of it. Are you performing only self penned material at the moment, or are you doing cover versions as well? – For now, we’re not doing any covers, only our own songs. I think we did one cover gig in the past, at a party. We didn’t have a lot of our own material, so we peformed a couple of covers. In fact it was before Ambush even started, I don’t think we even had the name. -Yeah, we’re really pleased about that one. A fantastic festival and we’ve been there for every year. It’s hard to describe the atmosphere, but it’s really special. The festival is very small. We’re all big fans of Sweden Rock Festival as well, but this is something completely different. Muskelrock is really something special. The festival feels real and the atmosphere is so nice. Which bands do you look forward to see this year? – Our Canadian friends in Axxion and the Finnish band Ranger, Black Trip and Antichrist as well. And Angel Witch of course. The lineup is very good. This entry was posted in Long Distance Runners and tagged Air Raid, Ambush, Enforcer, High Roller Records, RAM by leifkringen. Bookmark the permalink.